Production Planning and Control (PPC): To ensure proper execution of production at the right time and on time delivery/shipment production planning is required. Production planning department’s responsibility is very sensitive to the apparel manufacturing point of view. Production planner distributes line wise production from the buyer order list, set target to meet on time shipment date and execute everything for production. A wrong production plan can not ensure the right time delivery, which is not a good sign of the apparel industry. Production planner distributes line wise production from the buyer order list. Here in this article, we will have a detail discussion of what are the things required Production Planning and Control in Garments and how you can execute it. A production planner has to follow up below-mentioned work to implement production planning to progress production step by step. 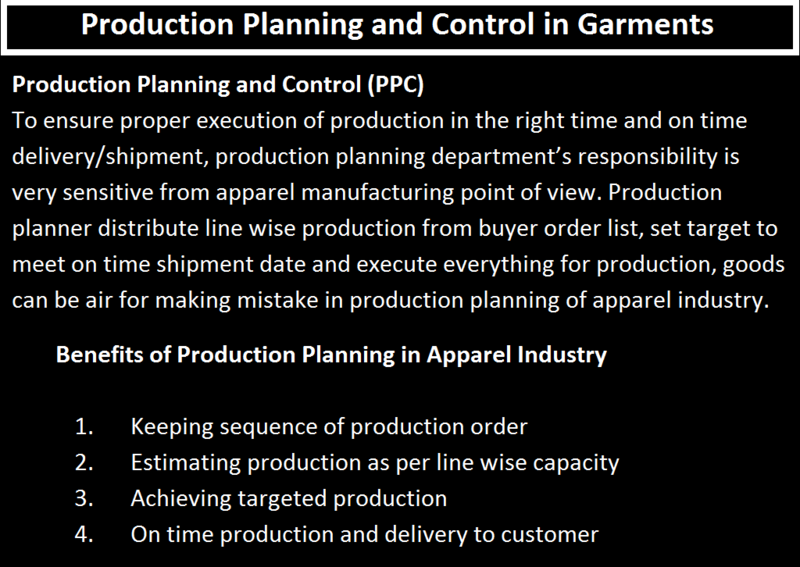 These factors are key to develop a production plan for the apparel industry. Implementation of production is not a very easy task for the garments industry as its change with time. Production plan implementation starts with cutting and finish with the packing of garments, long working between start and finish. A factory may get fabrics delay or trims or may fabrics can be failed in inspection for shade or visual defects, these problems hamper time and production planner has to change plan, may input next lot for production because you cannot keep line stop from production. So anything delay, next lot can be inputted for production keeping shipment date in mind. Plan updates every day depending on the current situation. Finally, Production planning is a continuous process as the production of a different lot is going on but you also required to maintain a good control system. By monitoring, you can identify whether your planning is perfectly working or not, if not then control is required to take corrective action. Tagged Benefits of Production Planning, Benefits of Production Planning in the Apparel Industry, Benefits of Production Planning in the Garments Industry, Benefits of Production Planning in the textile Industry, Control of Production Planning in Garments, Factors of Garments Production Planning, Implementation of Garments Production Planning, Production Planning and Control (PPC), Production Planning and Control in Garments, Production planning and control in Garments pdf, Production Planning in Garments, Things to Follow up by Planning Department, What is PPC, What is Production Planning and Control (PPC).